Battery interrupters let you use a switch to turn on and off most battery operated toys and devices. An inexpensive and easy way to use toys or devices you already own! We coat our disks to retard corrosion. This ensures your battery interrupter will last years, not months. We add reinforcement to our wires where they connect to the disk for added stability. We add a generous 16" of wire before attaching a durable jack to the end. 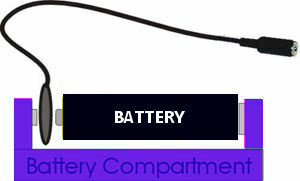 Simply insert our battery interrupter between "AA", "AAA", "C", or "D" batteries and make most items switch activated. The jack accepts a standard 3.5mm plug.This is a great option if you have a favorite toy or vocational-related device that needs to be adapted. Interrupters will only work in devices/toys that have an on/off switch that you slide or move to the ON position. They do not work with toys that are squeezed, have a button that must be depressed and held to make it "go", use a remote control to activate them, or use a 9 volt battery. Choose the size based on the battery size your device uses. Please see below for instructions on modifying an interrupter for small or odd shaped battery compartments. When submitting orders via mail or fax, please be sure to specify which size interrupters you are needing. If there is no specification, size AA/AAA will be shipped. Please allow additional handling time for bulk orders. We highly recommend using a triangle file to notch out the battery compartment door to allow the adapter wire to pass through. 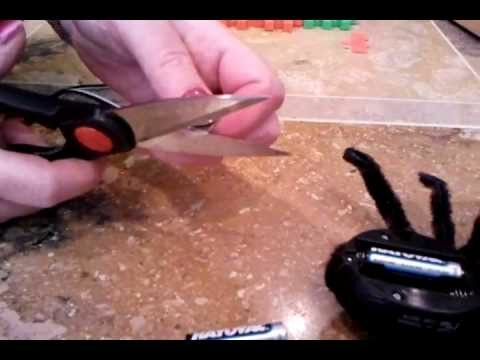 On occasion you may run across a battery compartment that is smaller or odd shaped (such as with AAA battery compartments) which won't allow the adapter to slide in. In these instances, the metal disk on the battery interrupter can be cut using heavy duty scissors or garden shears to make the interrupter fit. Click on the video to learn more. Gently slide the disk between the battery and the metal bump on the compartment. (Sometimes it is easiest to slide the battery interrupter disk and the battery in at the same time.) Do not use force on the area where the wires join the disk. 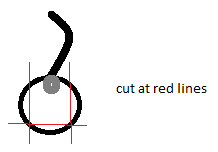 This area is not made to withstand pressure, which may cause the wire to break. Use a triangle file to make a small notch for the wire to fit through the battery compartment door before you close it. If you simply attempt to close the battery door on the wires, they will be smashed and may break. Frayed or broken wires are not covered by our warranty. 90 days against jack defects and de-soldering from the disk. Frayed or broken wires are not covered.